St. Petersburg has long been Russia’s artistic center. Now the city is reinventing itself as a top investment destination on the heels of Russia’s WTO membership. St. Petersburg, Russia’s “Venice of the North,” is renowned for its canals and high culture, as the host of the Hermitage art gallery and the Mariinsky ballet. Less visible to the tourists who stroll beside the canals on long evenings, as the far-northern summer sun stubbornly refuses to set, the city is also re-inventing itself as a top investment destination on the heels of Russia’s WTO membership. President Vladimir Putin, a St. Petersburg native, has taken pains to keep his home town in the spotlight, using the city as a backdrop for high-profile international events whenever possible, including last summer’s G20 summit. In 2012, this city of over five million people attracted $10.7 billion in foreign investment, nearly double the previous year’s figure, and hopes to hit $12.5 billion this year. The city’s economy grew 4.5 percent last year to $70 billion, faster than Russia’s national average, and its industrial production index hit 104.3 percent, among the best rates nationwide. Its key economic sectors include shipbuilding, automobile manufacturing, food production, radioelectronics, pharmaceuticals and metallurgy. Many of these are clustered around various parts of the city, with entirely new clusters - such as one focused on creative industries - now in the pipeline. The town that thinks of itself as the country’s artistic capital is also morphing into Russia’s Motor City, as foreign car manufacturers rush in. Last summer, Russia tipped past Germany to become Europe’s largest car market. Total car production soared 50 percent in St. Petersburg last year to reach 389,000 units, and a rising share of vehicles was exported to neighboring countries. Ford was among the first foreign giants to open a factory near St. Petersburg, in 2002, joining forces with Russia’s Sollers to build a factory that now cranks out 300 cars a day. The facility passed the 500,000 mark last summer. Toyota opened a factory in St. Petersburg in 2007, with a $133 million investment, followed by GM ($303 million) the following year. Nissan ($200 million) came next in 2009 and Hyundai ($650 million) followed in 2010. 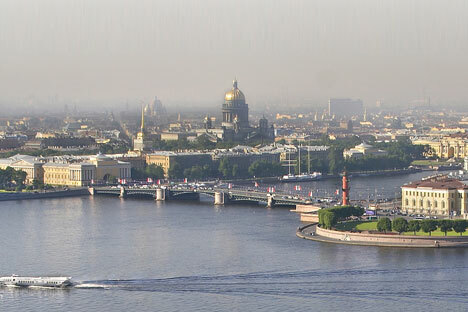 New transportation arteries have been critical to attracting the carmakers to St. Petersburg. A new $7 billion Western High-Speed Diameter highway now links St. Petersburg’s port with European markets in the Baltic states and Scandinavia. Over half of the funds for this were provided by private investors, as the city served as a pioneer for public-private partnerships in Russia. This December, the new $1 billion terminal of Pulkovo airport will begin operation and facilitate an increase in passenger traffic from eight million to nearly 20 million by 2025, making it one of Europe’s busiest air hubs. In another first for Russia, the terminal has been constructed entirely with private money. It will be operated by a consortium that includes German Fraport AG, as well as VTB Bank of Russia. In the face of this activity, St. Petersburg is still the city whose entire downtown area was declared a World Heritage Site by the United Nations Educational, Scientific and Cultural Organization, better known as UNESCO. St. Petersburg used the recent G20 summit to further increase its potential, hitting six million tourists annually in 2012 for the first time - an increase of over 12 percent from the previous year. To diversify its economy, the city has launched a series of technoparks and incubators for small and medium-sized enterprises (SMEs) in recent years. Meanwhile, the manufacturing sector remains the largest contributor to the city’s budget at nearly 40 percent. St. Petersburg’s Governor Georgy Poltavchenko has emphasized the need to foster innovation in the sector. “This is confirmed by the fact that St. Petersburg was recently named Russia’s most innovative region [in a nationwide vote],” he said. This article was prepared in cooperation with the St. Petersburg Committee for External Economic Relations.